Get Set…Ready…..SHOP!!!….. 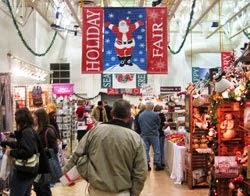 this annual Holiday Fair in downtown La Crosse is on November 21-24, 2013. This huge event is the most spectacular craft show of the season. The La Crosse Center is decorated with a holiday theme and holiday music through out the Center. Rudolph will make appearances and pictures with Santa Claus go on daily. Door prizes are given each hour every day. This is family event or a girl’s getaway! Hours are Thursday & Friday; Noon- 9pm, Saturday; 9am -5pm, Sunday; 10am -3pm. You will need some rest after the Fair with a overnight stay at the Westby House Inn! Sunday: 10:00 a.m. – 3:00 p.m.
© Westby House. All Rights Reserved 2019. Boutique Hotel Website Design and Hotel Marketing by Q4Launch.